Ludhiana, 13th May, 2016 : The Nurses week was celebrated from 6th May to 13th May, 2016. A function was organized on 12th May, 2016 to celebrate Nurses’ Day by Fortis Hospital Ludhiana. This day is observed to commemorate the Birthday of the founder of Modern Nursing, Miss Florence Nightingale. The theme of the Nurses’ Day 2016 was “Nurses: A Force for Change: improving health system’s resilience”. The programme was started by Lamp Lighting ceremony followed by banner unveiling. 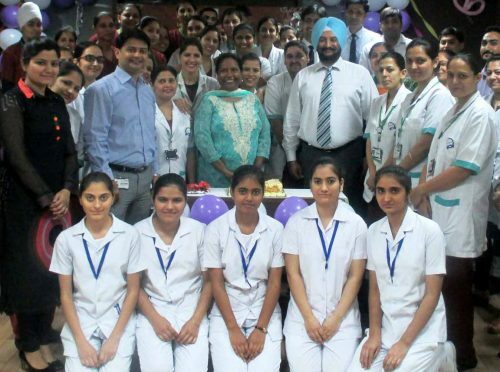 Mr. Vivan Singh Gill, Facility Director, Fortis Hospital Ludhiana and (Mrs.) Dimpy Joseph, Chief of Nursing gave their views on Nurses Day Theme. The scientific session was conducted by Dr. Balbir Kaur on topic “Management of Medication” in presence of Dr. J.S Sekhon, Dr. Vinay Singhal and Dr. Amit Gupta. During the week BLS (Basic life support) trainings sessions were also conducted in the various nursing colleges by Nursing and Quality team. Role play was enacted by the Nursing in charges and supervisors. Cultural programme was presented by the Nursing & other staff members. Awards were also given away to recognize the hard work and dedicated team efforts of nurses.